Work continues to get 56006 ready for next weeks gala. 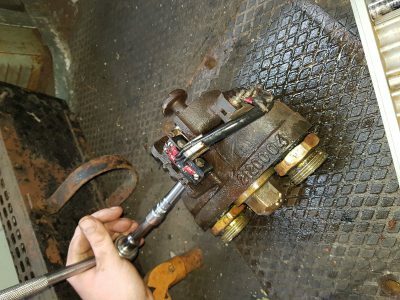 C56G volunteers spent today addressing a couple of faults on the two drivers emergency plungers on the locomotive’s brake system (one in each cab). Those who attended the East Lancashire Railway last July, when 56006 suffered a temporary brake problem when running round at Rawtenstall, will have seen the result of the failure of one of these switches to reset correctly. We’re glad to report that by the time we’d finished mid afternoon today, both valves were working correctly and reliably. A sticky DSD pedal was attended to and a defective cab door handle replaced. The work on the two valves involved some preliminary work before we could even get to the valves; removal of the drivers desk cladding, both drivers seats and the associated heaters. That said, even before the preliminary work could begin, we had to get to Bury Bolton Street shed. I was there early and managed to miss the road closures associated with a local 10k run, which delayed my colleague on his way in from West Yorkshire. Once removed from the drivers desk the valves were freed, disassembled, checked for damage or wear, greased and reassembled. They were then checked many times to ensure they operated, and more critically, reset after each operation. They passed testing and were then refitted to the locomotive. 56006 was then started up and the compressors built up the pressure in the brake system. Once the auto air pipe governor kicked in and the brake pipe gauge rose to the required 5 bar (72 PSI in old money! ), we could press the emergency plunger and check the air pressure dropped to zero instantly. It did and then when the plunger was pulled back up, the brake pressure was restored as it should do. Once the same test was successfully completed in No. 1 cab, the loco was declared fit again. I’ve deliberately written a bit more about today’s work on 56006 to demonstrate the kind of work we carry out, but also to hopefully encourage anyone interested in helping with 56006 to get involved. It’s not all technical work though and if anyone can use a rag and a paintbrush then 56006 is a bit like the Forth Rail Bridge; it needs constant care and attention to make sure it looks and works well. Given we haven’t had the best of starts in our first year at the ELR, we’re keen to have a big push with work on 56006 to make sure the locomotive remains operational and reliable during the next few years. As always, any training required will be provided, especially in how to work safely in the ELR environment. Applications are particularly welcomed from contortionists, detectives, clairvoyants and double jointed individuals!!!!!! Seriously, if anyone is interested in getting involved please use the contact details on this website or speak to me in person next weekend at the ELR gala. Even if you don’t want to volunteer, please say hello if you spot me (I should be wearing my trusty Oystermouth baseball cap). Saturday 22/09, 1150 Bury – Rawtenstall – Bury – Heywood (arr 1349), then 1405 Heywood – Bury. Loco then stables until it is attached to the rear of 1900 Bury – Rawtenstall, then works 1935 Rawtenstall – Heywood. Sunday 23/09, 56006 is attached to the rear of 0920 Bury – Rawtenstall, then works 1006 Rawtenstall – Heywood. Then the loco tails 1125 Heywood – Rawtenstall before working 1246 Rawtenstall – Heywood. Finally, it returns as tail engine on the 1405 to Bury, arriving at 1418. 56006 then goes onto shed.